New edition! The perfect dictionary for quick, on-the-go language reference. Features 40,000 entries. Clear, concise, definitions, variant spellings, and pronunciations. Includes a brief guide to punctuation. For more than 150 years, in print and now online, Merriam-Webster has been America's leading and most-trusted provider of language information. 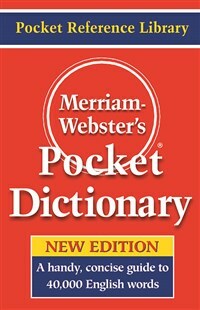 All Merriam-Webster products and services are backed by the largest team of professional dictionary editors and writers in America, and one of the largest in the world.